Caption slip reads: "Photographer: Paegel. Date: 1954-05-04. Reporter: T.T. Assignment: Blue Star Mothers convention. 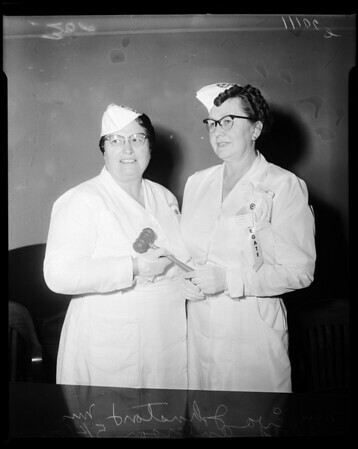 L. to r.: Mrs. Eva Johnston, outgoing president of Blue Star Mothers of America, Calif. Dept., and Mrs. Mildred Anderson, 53, of North Long Beach, newly-elected President for 1954-55".